Watch 11 Professional Getresponse Training Videos For Free! 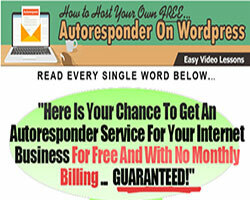 Grab The Free WP Autoresponder Plugin Now! How To Build Your Super-Targetd List That Is 97% More Responsive! www.sendfree.com: Free Autoresponder, Also doubles up as a Free targeted email advertising tool for you! You get to place Free Ads in other Member's Autoresponders! www.getresponse.com: Free Autoresponder for 30 days. Remember to grab your copy of the Free bonus report: "How to double your sales with a proper email strategy" from the site. Also, read the full Getresponse review available here. You may also download an entire set of 11 free Getresponse training videos here. Editors Note: On testing, we found Getresponse customer service to be exemplary. Every email was answered professionally and telephone calls were well attended to. www.freefollowup.com: Free Autoresponder with absolutely no advertisement but no import facility. Use this for small lists but the moment your list crosses 500, shift to a professional one. The service is 100% FREE without any monthly charges, there is a one time setup fee of $4.99 upon joining. www.aweber.com: Free Autoresponder for 30 days. One of the original Autoresponder providers! Also one of the best with a very reliable service at very affordable rates. This is a great option if you really want a professional Autoresponder that is affordable! Currently, they are offering a 30-day trial where you can test out the full features of the Autoresponder service for a month. Most importantly, if you hobnob with any other free Autoresponder or paid services and later on if you want a switch to Aweber, it can get difficult to import your list to Aweber unless with double-op-in again! Your list needs to be approved by their import specialists. So if you are new and starting fresh -- start with Aweber. It is strongly suggested that you watch these Video Tutorials on Aweber before you decide on anything else. You may also read the full scale Aweber review here. Editors Note: On testing, we found Aweber customer service to be excellent and beyond par. They answered our emails and telephone calls promptly and patiently. Friendly Advice: Its better to use a paid Autoresponder anytime. Or you run the risk of loosing your list list without warning with a free Autoresponder! Why bother when you can get starter packs for as low as $15/month. Is it worth to save a few paltry dollars at the cost or risking your email list, which can be worth a small fortune? Don't make the mistake of being penny wise and pound foolish! Start with free trial offer of 30 day from any of the professional Autoresponder services mentioned here before you decide. www.mailrelay.com: Free Autoresponder allows you to create, send and manage your newsletters with behavior statistics. You can send 15.000 monthly emails to 3.000 subscribers. Also if you follow them in Twitter and Facebook he/she will get up to 25.000 monthly sends to 5.000 subscribers. www.icontact.com (Not Free - But 30 Day Free Trial): iContact.com is another popular Autoresponder service with large corporations such as Coleman, Electrolux, and Frigidaire. Their prices are very competitive and definitely worth considering. You can take a 30-day free trial to verify the service. They muster INCREDIBLE deliverability, always gives friendly prompt service, and extremely helpful. The user interface is newbie friendly and easy to navigate. Get your free 30 day trial. You may also read the full scale iContact review here. www.constantcontact.com (Not Free - But 60 Day Free Trial): Constant Contact email services blends your email campaigns and your social networking campaigns into a single matchless and easy-to-use service. They provide an email marketing service with 400+ customizable templates and the option to insert text or your own HTML code into the emails. you also get a 60-day-free-trial with this email marketing service. Constant Contact also offers extra features like video links, images, blog content, Autoresponders, surveys and more marketing tools that fosters your clients and subscribers to interact with your email messages and newsletters. Get your free 60 day trial. Also read the full fledged Constant Contact review here. www.campaigner.com (Not Free - But 30 Day Free Trial): A well priced and one of the most versatile autoresponder and email marketing online tool available in the current market. Has more than 500 email templates, mobile and social network ready and can give you detailed reports to measure the effectiveness of your email marketing campaign effectiveness. .
With a string of useful tools like facebook integration, import facility, tracking, html editor, custom design, email campaign statistics and reporting etc., Campaigner will give you most value for your money. Also gives you API and CRM integration with several third-party applications. . Get your free 30 day trial. www.benchmarkemail.com (Free Up To 2000 Contacts): Offers very powerful email marketing tools with generous plans suitable for lower budgets as well as both experienced and the inexperienced. The autoresponder system lets you schedule individual emails to send at the time of your choosing and can send even birthday emails. Features include custom multiple autoresponders, image & file hosting, integration with other software applications, rss to email, scheduling, social media sharing, triggered campaigns and more. Get your free offer. www.1shoppingcart.com (Not Free - But 30 Day Free Trial): This is an all-in-one marketing solution apart from the Autoresponder services they provide. They offer an email marketing platform with good deliverability, has a built-in shopping cart and can set up affiliate promotions. It’s a good service to opt for entrepreneurs who wants something simple but need to move fast to cash on new and emerging opportunities. Automated email marketing is what differentiates them from other shopping cart providers. You can create targeted email campaigns based on your customer behavior and purchase history as Autoresponders are built in! No further headaches of exporting or importing data into another Autoresponder service. Get your free 30 day trial. www.mailigen.com (Not Free - But 30 Day Free Trial): This is a feature rich Autoresponder and email marketing system. It has the ability to build multiple subscriber lists, create and send newsletters, survey your subscribers and analyze your results for optimum performance. 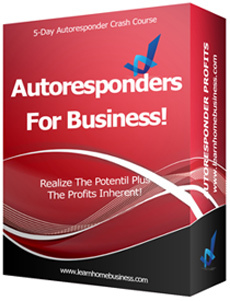 There are many Autoresponder providers out there with great features and tools. But, it can get bit hard for the newbie to figure out all of them. This one is easy enough for even the newest marketer to use. It's quick to set up and simple to use. Get Your Free 30-Day Trial. www.imnicamail.com (Not Free - But inexpensive): Looking for an inexpensive Autoresponder? That too starting from $3 with a delivery rate of 94% - that's close to the top two services! Then, ImnicaMail could be your choice. All paid plans do not insist on a forced double opt-in. Comes with full-fledged features like Autoresponder, Survey, Email Builder, Email Analytics, Website Integration, Email Templates, Unlimited email sending and more. They also have a free Autoresponder service with a limit of 1000 but will have their Ad logo, should be double opt-in and with a restricted monthly sending limit. www.emailaces.com (Not Free): This is one of the cheapest and one of the most professional autoresponders. They have many schemes for any budget. So if you have a shallow wallet, this is the one to go for. www.simplycast.com : (Free And Paid), You get up to 1000 subscribers to keep in the free mode. Features include Form Processing for your site, Online Form Builder, Autoresponder, and easy integration into your existing site! 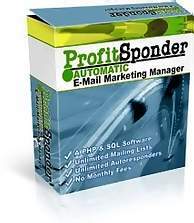 But it also stands out from the rest of free Autoresponders around. You get additional tools like Twitter Marketing, SMS marketing, Survey Marketing and more apart from being a Free Autoresponder. Sign up for free here. www.ontraport.com (Free - Demo): Ontraport is for the advanced user. The service is pretty solid, all-in-one platform that meets your CRM, email management, and landing page needs. It also uses Boolean logic rules to quickly automate the functions. All in all, a good marketing automation software. www.officeautopilot.com (Not Free - But 15 Day Free Trial): OfficeAutopilot is a real COOL tool with mind boggling features that goes beyond and Autoresponder service! The site is very user friendly and they get high deliverability. Apart from sending emails, you can set up post cards and can make pre-recorded phone calls. You can also process orders through their shopping cart. This awesome service does not come cheap but you can have a free trial. If you would like to run your own autoresponder without paying high priced monthly recurring autoresponder fees...then here is a top solution for you with much more power, total efficiency and absolute control! Inside This Easy To Follow 5 Day Autoresponder Crash Course You Will Be Introduced To The Power Of Autoresponders And What They Can Do For Your Business! Inside Each Lesson you will be shown how you can use autoresponders to effectively build your business, promote your products, services and affiliate programs in a way that's sure to increase your profit margin multifold! Research Proves: About 96% of ALL online businesses fail... and 82% among this 96% NEVER used an autoresponder! You need an autoresponder to make profits. You'll also discover simple and effective tactics to make autoresponders work more effectively! "The autoresponders For Business Crash Course was designed with beginners in mind and will quickly introduce you to the power of autoresponders and show you how to use them to your advantage!" The best part is... it is absolutely free and comes with $1000 worth of free gifts! Did You Join An Elite Club And Claimed Your Free Autoresponder?